Revelation 12 provides an overview of three major players in the world today and their impact on end-time events. Whom do the woman, Child and dragon represent, and what can we learn from this section of Bible prophecy? The book of Revelation is a vision from Jesus Christ, given to Him by God the Father, which reveals what is going to happen before His return to establish the Kingdom of God on earth. This fascinating book is also called the Apocalypse, from the Greek word that means revelation. This prophetic book is primarily written in a chronological style with occasional breaks for overviews of specific subjects. Revelation 12 is one of these overviews, providing a history stretching from the time before humans existed until the time just before Christ’s return as King of Kings and Lord of Lords. Revelation 12 begins with the statement: “Now a great sign appeared in heaven” (verse 1). The word “sign” comes from the Greek word semeion, meaning “a sign, mark, token … an unusual occurrence, transcending the common course of nature” (Thayer’s Greek Definitions). The first great sign is a vision of a woman who gave birth to a child (verse 1). Then in verse 3 we read, “And another sign [semeion] appeared in heaven.” We thus understand that these three symbols—a woman, a child and a dragon—represent things beyond the ordinary events of nature. As we are going to see, these three figures symbolize three major spiritual forces that have been at work for several thousand years. In order to understand this chapter, we now need to understand the symbols. What do the woman, the Child and the dragon represent? The woman of the Apocalypse—described as being “clothed with the sun, with the moon under her feet, and on her head a garland of twelve stars” (verse 1)—represents Old Testament Israel. In the Old Testament, God referred to His people as a woman whom He had dressed in honor and splendor (Ezekiel 16). The garland with 12 stars may be symbolic of the 12 tribes of Israel (Genesis 37:9-10). Throughout Revelation 12 we note that the “woman” is repeatedly protected by God (verses 6, 14-16), especially as the time approaches for the “kingdom of our God” to be established on earth (verse 10). In the New Testament, God’s Church is symbolized as a woman; and its members are likened to virgins (Matthew 25:1-13; Revelation 14:4; Revelation 19:7). The New Testament Church is called “the Israel of God” (Galatians 6:16) and likened to “Jerusalem above,” which is called “the mother of us all” (Galatians 4:26, also see Hebrews 12:22-23). Members of the Church are described as “a chosen generation, a royal priesthood, a holy nation, His [God’s] own special people” (1 Peter 2:9). When Christ returns to earth, He is going to marry the Church, which is called “His wife” in Revelation 19:7. Read more about Jesus Christ and the Church in our article “Marriage Supper of the Lamb.” Based on these passages, it is clear that the woman in Revelation 12 represents God’s people. Who is the Child in Revelation 12? The woman (God’s chosen nation of Israel) is described as giving birth to a “male Child who was to rule all nations with a rod of iron” (Revelation 12:5). Indeed, Jesus Christ was born into this nation. The verse continues, “And her Child was caught up to God and His throne.” The language here makes it clear that Jesus is the “Child” in Revelation 12. Jesus is the One who is prophesied to “strike the nations. And He Himself will rule them with a rod of iron” (Revelation 19:15). He is also the One who, after His resurrection, was taken up in a cloud to heaven (Acts 1:9-11). The third symbol of Revelation 12—“a great, fiery red dragon” (verse 3)—is described as having drawn “a third of the stars of heaven” and standing “before the woman who was ready to give birth, to devour her Child as soon as it was born” (verse 4). A few verses later, this dragon is clearly identified as Satan: “So the great dragon was cast out, that serpent of old, called the Devil and Satan, who deceives the whole world” (verse 9). As for the dragon drawing “a third of the stars of heaven,” this reference apparently represents Satan leading a third of the angels in a rebellion against God. Other passages show stars represent angels (Revelation 1:20). If God has “ministers of righteousness,” Satan also has his servants—physical ministers (themselves deceived and helping deceive others) and spirit beings who pass themselves off as righteous but incite human beings to sin (2 Corinthians 11:15; Ephesians 6:12). Jude further describes the fallen angels or demons as “angels who did not keep their proper domain” and who are now “reserved in everlasting chains under darkness for the judgment of the great day” (Jude 1:6). Revelation 12:3-17 is a concise history of Satan’s efforts to thwart God’s plan to bring many humans to glory as part of His eternal family. Satan’s actions included convincing a third of the angels to follow him in his attempt to make himself like God, attempting to have Christ killed as a child (Matthew 2:13-18), working to deceive the entire world and persecuting God’s people. Let’s now consider in greater detail Satan’s attempts to derail God’s plan. In Revelation 12:4 we read that “the dragon stood before the woman who was ready to give birth, to devour her Child as soon as it was born.” This appears to be a historical reference to King Herod’s effort to destroy Jesus as a young child by ordering the deaths of all male children from two years old and under who lived in and around Bethlehem (Matthew 2:13-18). But an angel had warned Joseph to flee to Egypt with his wife and Jesus to keep the Child from being destroyed (verse 13). Even though Satan’s attempt to destroy Jesus when He was a child failed, the devil did not give up. Prior to the beginning of Jesus’ ministry, “Jesus was led up by the Spirit into the wilderness to be tempted by the devil” (Matthew 4:1). During this temptation, Satan tried to get Jesus to violate God’s law and worship him instead of God. The devil offered Jesus “all the kingdoms of the world and their glory” (verse 8) if Jesus would worship him. But Jesus did not do so. When Jesus’ ministry was fulfilled and it was time for Him to give His life as payment for humanity’s sins, Satan was there once again. On this occasion, Satan was the one who “put it into the heart of Judas Iscariot, Simon’s son, to betray Him” (John 13:2). Although Satan was clearly involved in the crucifixion of Jesus, this was actually part of God’s plan for the redemption of mankind. As Genesis 3:15 had predicted, there would be ongoing “enmity” between the serpent (Satan) and the woman (God’s people) and the “Seed” (Jesus) who would come from the woman. Furthermore, this passage indicated that Satan would have limited success in being able to “bruise” Christ’s heel by influencing the man who would betray Jesus and that Jesus would “bruise” Satan’s head by resisting his temptations and qualifying to replace him as the ruler of this world. So why did Satan expend so much effort in his attempts to destroy Jesus? Because if there had not been a perfect Savior to pay the penalty for humanity’s sins, God’s plan would have been thwarted. Without a Savior, humans could not be forgiven of their sins nor could they live forever in God’s eternal family. In addition to his efforts to destroy Jesus, Satan has a long history of persecuting God’s people, especially members of God’s Church, represented by the woman in the latter portions of Revelation 12. Although there was fierce persecution from the earliest days of the New Testament Church, God allowed the woman to flee “into the wilderness, where she has a place prepared by God, that they should feed her there one thousand two hundred and sixty days” (verse 6). This verse indicates that the true Church was protected by God for 1,260 years (see Numbers 14:34 and Ezekiel 4:6, showing that a day can represent a year). During this time—which may have continued through the Middle Ages—the Church was protected from its enemies, including the Roman Empire and false Christianity. The next two verses then explain that “war broke out in heaven” between Satan and his angels and Michael and his angels. As a result of this war, John, in vision, saw that a place for Satan and his angels was not “found for them in heaven any longer” and they were “cast to the earth” (Revelation 12:7-9). This battle is different from Satan’s original rebellion, which is described in verse 4 and which occurred long before the birth of Christ. The setting for this battle, described in verses 7-9, and its significance is then announced by a loud voice in heaven (verses 10-12). This battle is an indicator that “the kingdom of our God, and the power of His Christ have [or will soon] come” (verse 10). Prior to this event, Satan has had access to God’s presence to accuse His people (Job 1:6-7; Job 2:1-2). Now he and his angels no longer have this access and are cast down to the earth. 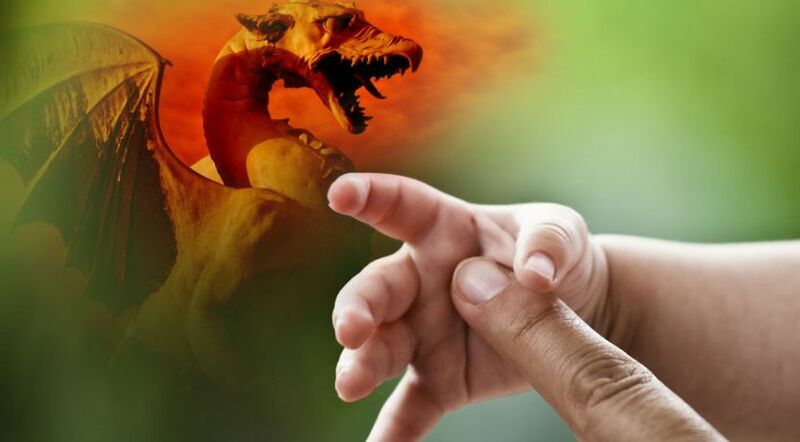 Realizing the significance of this event, Satan the dragon now has “great wrath, because he knows that he has a short time” (Revelation 12:12) before Christ returns to establish the Kingdom of God on earth. He then directs his rage toward God’s people, the ones who are the continuation of the woman of the Apocalypse who gave birth to the male Child (verse 13). God, however, will not allow Satan to destroy His people. Jesus had promised that the “gates of Hades [the grave]” would not prevail against it (Matthew 16:18). To protect His people, the woman is “given two wings of a great eagle,” meaning she is safely taken into “her place,” where she will be protected for “a time, and times and half a time [apparently 3½ years], from the presence of the serpent” (Revelation 12:14). Even though Satan will spew “water out of his mouth like a flood,” to try to get at the woman, he will not be successful (verses 15-16). In this passage, the concept of a “flood” likely represents armies (see Isaiah 59:19; Jeremiah 46:7-8). Satan then goes to “make war with the rest of her [the woman’s] offspring, who keep the commandments of God and have the testimony of Jesus Christ” (Revelation 12:17). From this passage we note that while some members of God’s true Church will be protected from Satan’s wrath during these end times prior to Christ’s return, others will not. Those not in the place of protection will need to prove their allegiance to God the Father and Christ in the face of Satan’s intense persecution. Whether you realize it or not, Satan also hates you and will do everything possible to keep you from loving and obeying your Creator. His anger is not just against Jesus and the Church. Why is he angry at you? Apparently, because he realizes that humans were created by God with the potential to be higher than he was (Hebrews 2:6-8). Because of his sick, twisted and unsound thinking, Satan has taken on the role of being an adversary against those seeking to love and obey their Father in heaven. Writing to the people of God, Peter cautioned, “Be sober, be vigilant; because your adversary the devil walks about like a roaring lion, seeking whom he may devour” (1 Peter 5:8). In communicating with the brethren in Corinth, Paul described the true gospel as being “veiled” or hidden because of Satan, “the god of this age,” who had blinded the minds of unbelievers (2 Corinthians 4:3-4). The good news is that this “veil is taken away in Christ” (2 Corinthians 3:14).